While out on a Christmas Day stroll along a stream to the south of Buenos Aires, Argentina, Jose Antonio Nievas spotted something peculiar sticking out of a riverbank. The object was greenish and pebbly, and at first Nievas thought he had discovered an enormous dinosaur egg. He was wrong. "My husband went out to the car and when he came back he said, 'Hey, I just found an egg that looks like it came from a dinosaur,'" Nievas' wife, Reina, told AFP. "We all laughed because we thought it was a joke." Exactly what species of mammal Nievas found has not yet been determined. Early reports of his discovery have not announced plans for experts to excavate, examine and care for the fossil. But palaeontologists asked to comment on the initial photos of Nievas’ dig have conclusively identified the shell as that of a glyptodont. A what? There’s nothing quite like a glyptodont alive today. While they’re superficially similar to their relatives, the armadillos, in having body armour made of bone, the glyptodonts had solid, rounded domes for shells rather than the more flexible bands of their cousins. 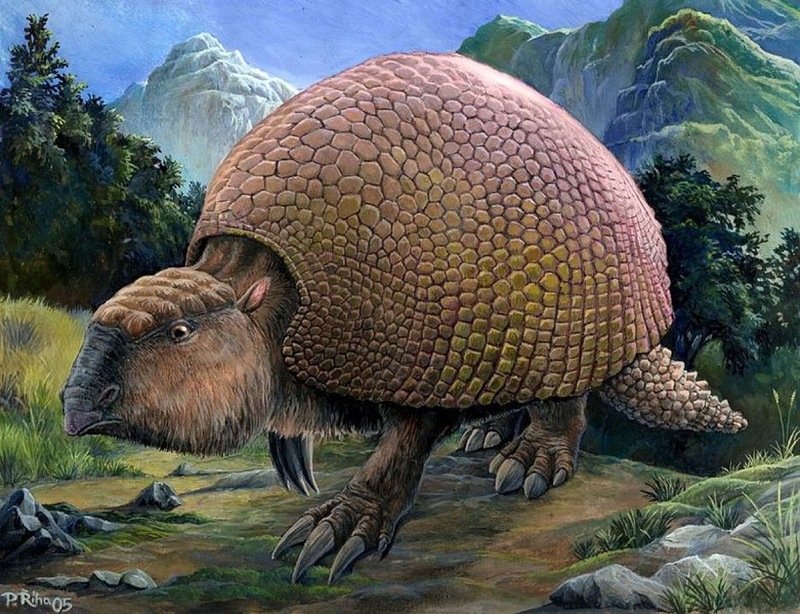 More than that, many glyptodonts had caps of bone over their skulls to help protect them from jaguars, sabre-toothed cats and other predators of their time. Some species, such as Doedicurus, took defence to the extreme with mace-like tail clubs. Ultimately, though, all the glyptodonts died out. The very last of their kind disappeared by about 10,000 years ago, with climate change and ecological disturbance by prehistoric people being the leading suspects for extinction. Early estimates from experts suggest that Nievas’ find is probably from around this time, right when the great mega-mammals of the Americas were fading away. Hopefully, paleontologists will soon be able to dig into this new discovery and draw some Ice Age secrets from the shell.